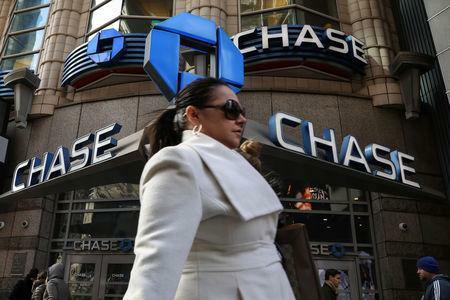 NEW YORK (Reuters) - JPMorgan Chase & Co has awarded 47 financial grants to university faculty and PhD students for artificial intelligence research, ramping up its efforts in the emerging technology, the bank plans to announce later on Monday. Winners of the JPMorgan's first AI Research Awards will study the use of AI and machine learning in areas including investment advice, risk management, digital assistants and trading behavior. The bank declined to disclose the size of the grants. JPMorgan and other financial institutions have been investing more to develop artificial intelligence-based technology to better process the vast amounts of data they collect and produce, and to become more efficient. But they are struggling to compete for the best computer-science talent with Silicon Valley startups and large technology companies such as Alphabet Inc's and Amazon.com Inc. Through the awards, the bank hopes to deepen ties with academia following the creation of its AI research division less than a year ago, Manuela Veloso, head of JPMorgan's AI Research, said in an interview. Veloso's 16-member unit helps the bank come up with ways for AI to improve its internal processes, by automating more mundane tasks, and enhance services to clients. The bank spends around $11.5 billion a year on technology and employs more than 50,000 workers in IT. "The world is becoming increasingly digital and there is a lot of data," Veloso said. "The only way for this data to be truly useful is to have an AI solution to process it." The division's areas of research include data and cryptography and ethics and fairness. While the grants do not require PhD fellows to join JPMorgan upon completing their studies, the hope is the awards can help attract talent. "We want AI and other technical students, when they finish, to also consider joining JPMorgan instead of only thinking about the tech companies," said Veloso, who is on leave from Carnegie Mellon University.